GoodReads: In a continent on the edge of war, two witches hold its fate in their hands. Initially, I was a bit unsure about Truthwitch, because I didn't enjoy the author's debut novel Something Strange and Deadly. In fact I ended up DNFing it. In the end, however, the buzz led me to the GR page, and I have to admit I was intrigued. Firstly, because it's high fantasy (my favourite genre), and secondly because the summary promised action/adventure and a female friendship. 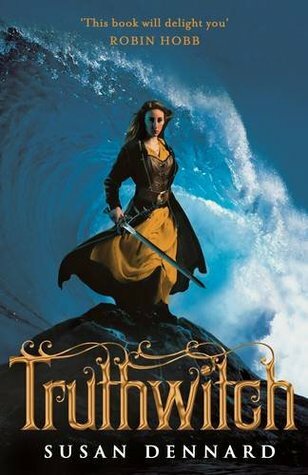 Although I wasn't as massively blown away by it as some people seem to be I really did enjoy Truthwitch. I liked that it was action packed from start to finish, and the strong friendship between Safiya and Iseult was a bonus. It's not too often I see female friendships like this one in YA. My favourite out of the two leading ladies is Iseult. What frustrated me about Safiya was her hot-headedness, and the way she did stuff without thinking things through. I also didn't care for the romance between Safiya and Merik. As much as I thought Merik was interesting as an individual I didn't quite feel anything towards him and Safiya as a couple. As for Iseult, I probably shouldn't, but I ship her and Aeduan. Every time they were in a scene together I was all *_*. Aeduan was such a complex and layered character, I hope we learn more about him in the sequel. Finally, the world presented in Truthwitch was fascinating, but the actual world building was shaky. We are introduced to a lot of new terms, etc, but there isn't much of an explanation into it all. So, I'm hoping we'll learn more about the world in the sequel. To conclude, I'm glad the hype surrounding Truthwitch led me to read the GR summary and consequently pick up the book, because it was a great read. I did enjoy this one quite a bit towards the second-half but I'm not sure I'll be continuing this series. I loved the world but the characters, though intriguing, were not unique enough for me to become truly invested. I'm glad this really worked out for you, though, Renu! I'm glad you enjoyed this overall! I admit the buzz for it has me wanting to pick it up too, but I just haven't had the time yet. I know I will appreciate this strong friendship everyone is talking about! I have one more chapter to read of this book and I am so glad someone else enjoyed it but wasn't blown away, I have seen review from people who adore this book and some who hated it but not that many in between. Aeduan is such an interesting character and I look forward to seeing more of these different layers to his personality, I hadn't even considered him and Iseult being a possible couple, interesting idea!